It’s that time again! 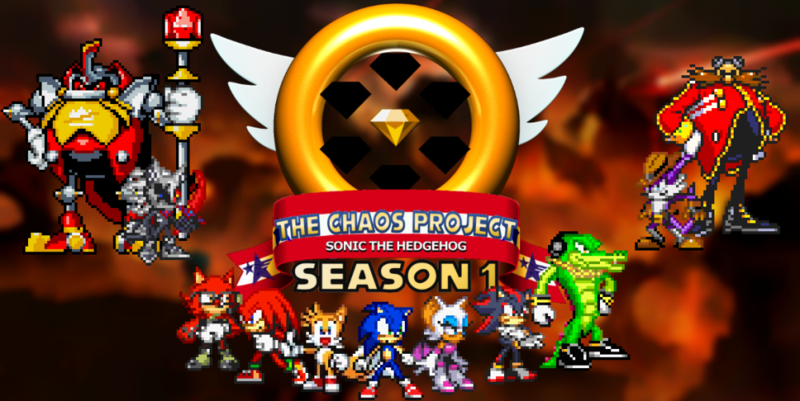 Time to get a sneak peek at the next episode of The Chaos Project! Shadow’s been acting strange recently. And Sonic has finally come to confront him about it. But it seems Sonic is the last person Shadow wants to hear from. Shadow suddenly stands, and walks past Sonic without a word. Shadow stops just long enough to answer, “For a walk. You wanted me to get out, didn’t you?” Then he continues his way out. Sonic doesn’t stop him. Shadow marches along past the row of tents that mark the Rebellion camp, following along with the stream that runs through the center of the canyon. The camp seems to be pretty quiet, apparently mostly empty. He continues to walk in silence for quite some time. Eventually, he reaches a large, thick tree right in the canyon’s center, with an Emerald-shaped carving in its bark. The memorial for Chaos. He stops to stare at it for a while. His eyes shut as he clenches a fist at his side. Then he walks on past. The area he proceeds into has quite a few more trees, almost like a small forest contained within the widening walls of the canyon. After a few moments, another pair of footsteps fall in line beside his. Shadow finally looks up and around his shoulder. Hero gives him a smile and a wave as he continues to walk alongside him. Hero gives a shrug, and waves a hand past Shadow out to the forest. Beside Hero, Bruno lets out an angry squeak as he shakes a balled up tentacle at Shadow. Hero gasps at whatever it is he hears in the alien language, and starts waving his hands to get him to calm down. Hero glances around for a moment, but eventually gives another shrug. Hero pulls his Wispon close, while Bruno moves around to watch his back. But everything is silent. A dark-furred figure stands with his back pressed against the shadowed side of a tree, trying as hard as he can to glance around it without being seen. In his hand, the headband-wearing Jackal holds a weapon, a long dagger with a green hilt and a wavy blade. Who could this bladed assailant be? What could he want? And what’s wrong with Shadow? Find out, on the next episode of The Chaos Project! Well… I…. No, just watch. Well, there you have it. I first watched this video an hour before writing this, and I’m still sort of in shock. I’ve seen endless comments on just about anything Sonic-related online asking something along the lines of, “Will the third character in Sonic Forces be a self-insert?” My reaction every single time was, “What the heck would give you that idea?” Well…it is. I am not angry. Far from it, in fact. I’m just confused. If done right, this game could have had plenty going for it without such an extreme gimmick. It seems a little…desperate, I guess. I know it sounds kind of odd, coming from me, a guy whose story is practically dependent on its OCs. You’d think I’d be thrilled to make them at least somewhat of a reality. Of course, how much freedom is allowed is a complete other question, but I don’t see it as likely that any of my characters can be replicated in the game. But, the point I was originally making, while there certainly is a considerable fanbase that this would excite, I don’t know if they’re really making the right targeting choices. More on that a bit later. First, take a look at this “Hero” gameplay unveiled at the same time (“Hero” is what this guy seems to be called until further notice). First of all, the setting of this footage has been given the newly-unveiled name of Park Avenue. Sounds a little happy, but I’m not here to criticize names. Hero uses gadgets such as a grapple gun and his wrist-mounted “Wispon” to make his way through the Eggman-ruled planet (technically it can be a girl, but I’m using male pronouns for simplicity). The first thing that I noticed is that it seems like he is not only in the same location as the Modern Sonic gameplay that we’ve seen, but that it seems like it could be literally Sonic’s level, played as a different character. This concerns me. I suppose I have no right to complain, seeing as level recycling is a major factor of the Adventure games that I hold so highly. But if Modern and Classic Sonic have completely different levels, but this character just shares his with Modern Sonic, it’s going to feel like he’s completely useless, shoehorned in just to appeal to the OC makers. Then there’s the sad fact that, based on what little footage we have, it seems that Hero has more 2D than 3D. It really saddens me, because this once-mysterious third character seemed like the perfect chance to appeal to all three of the largest fanbase factions at once. Give the Classicals Classic Sonic, the Modernists Modern Sonic, and the Adventurers this third character. A 2D style, a 3D style, and a hybrid style. Who could ask for more (bad question)? And while that may just sound like pining coming from an Adventurer like myself, it does bring up a real issue. If Classic Sonic has his complete own style, but this new character just plays like slower Modern Sonic plus gadgets, it could make the entire game feel disjointed, disproportional, whatever you want to call it. Unless, of course, Classic Sonic has as much gameplay as the other two combined, which would actually be even worse, completely ripping the spotlight away from the main character. Point is, opportunity missed, potential problems presented. The next thing to talk about is lore/story. First, the character himself. His existence scares me in terms of story for a few reasons. On the more obvious side, a create-your-own-character is very difficult to develop as a character, since who they are is supposed to be more dependent on you. But this person doesn’t have to have to have complicated backstory by any means, so long as his presence in the game’s narrative is justified, which is still just a little more difficult than it sounds. The most comparable thing that I’m familiar with would be Nintendo’s Fire Emblem Awakening, and its use of Robin. Robin is completely customizable to the player’s liking, including his/her name. I won’t give any spoilers for those who haven’t played, but I can say that Robin was handled perfectly, because they act as far more in the story than just an avatar. And, as much as I like Sonic, I don’t know if I trust Sonic Team to do so well, and that’s why I’m scared. Even if Hero’s gameplay were the most fun, entertaining thing to ever come the Sonic series, I wouldn’t want him to just be there because he is in terms of the story. On a lesser note, we have the logistical concerns for how the story is presented. The trailer suggests (though doesn’t confirm) that this customizable character appears in full-rendered cutscenes, which is a development nightmare. Game engine-rendered cutscenes are one thing, as all of the characters can share the same basic skeleton and movements. But as for the cinematic stuff, the scenes where all of the most important story events happen, that’s a lot harder to generalize for all custom possibilities. If you look closely at the reveal trailer, you can see how Hero’s fur blows around in the wind and explosions, which can’t translate easily to the other species choices, who don’t all have fur in that specific location. Point being, that either means they’re going to severely limit such cinematic cutscenes, which is a bad sign for the story, or they’re going to limit Hero’s appearances in such cutscenes, which is a bad sign for his personal story as well as the game as a whole. Or, they can do what pretty much no one expects them to do at this point, and put in a ton of time and effort to make this game absolutely perfect. Ha ha, as if. The other thing to talk about is the Wispon, best seen in the image above. Supposedly, it is customizable to some degree, though exactly how is unclear. Point is, this is meant to be the next step in Color Powers, the thing that makes Wisps a real element in this game, rather than just being thrown in as they were in Lost World. It might surprise you to hear that I actually like the sound of that. As much as I disapprove of the abuse of Wisps, this is a good sign that something might actually get explained this time. The device suggests that Wisps, at least to some degree, are becoming normalized in the Sonic world, such that people are studying them and creating technology dependent upon them. I’m still waiting to hear why they left the planet and then were magically back again, but this is at least a start. The only other general reaction to speak of are the customization options. I’m fairly impressed by number of choices available…unless what we see in the trailer is all there is, in which case I’ll be disappointed. As I mentioned earlier, I doubt you can do anything with the shape of the body (or head-and-spikes) beyond the choice of species meaning that there’s pretty much no way I’ll be able to make Zero or Chaos, and, unless they specifically intend for the ability to make Shadow clones, that goes for Blacklight as well (Black Cloak is a maybe). The one other thing to point out are the freaking Chao backpacks! Not counting Generations, this is the first mainstream acknowledgement of Chaos as far as I know of since 2005 with Shadow the Hedgehog (where they had a great send-off: letting you murder a room full of them for free dark points). I doubt that it means anything for other Chao appearances in the game, but it’s very nice to see. These options are actually a very good opportunity to reference other forgotten things of Sonic history, and maybe even a few other SEGA things as well. I can only say that I hope the options are as wide and varied as possible. Of course, as always, we now have my specific Chaos Project-related reactions. Since that’s in recent memory (I started writing an hour and a half ago), I’ll start with the Wisps. As glad as I am that Wisps have a purpose, that also means that I’ll have to start acknowledging them as a normalized part of the world in my story, something I certainly haven’t been doing so far. If they really are so normal, it might actually make my existing episodes a contradiction, seeing as the Wisps don’t seem to exist at all. I’ll probably have to dedicate a Season 1 episode to rectifying that, which I was already planning on just for the sake of Lost World, but will now have to be a bit more complicated. Don’t expect to see any Wisps in the story until then. Now, for Hero. I’m definitely going to have to wait to see more until I determine how to treat him in the long-run of the canon. His existence in and of itself certainly doesn’t contradict anything that I have (though his use of gadgets certainly bears a resemblance to Black Cloak). But, so far as I can tell, there is no easy way to integrate this. First of all, the red Wolf with glasses, the one seen in the trailer and gameplay, may or may not be acknowledged as the “real” face of this Hero, similar to how white hair is assumed real for Robin in Fire Emblem. It also might just be a proof-of-concept example. And Robin brings up another important question. Does this “Hero” have a default name? If he does, that, combined with the look shared by the trailer and the gameplay, may just be enough to allow for, at very least, an appearance in the Chaos Project. If there is no strongly-pushed default name like Robin, then there’s not much I can do. Of course, he could be killed at the end of the game or whatever else, making this discussion pointless. But if there’s even the slightest chance that I can use this character, I want to. More characters means more—and in some cases better—stories to tell. Maybe, if this game falls short on Hero’s backstory, I can…pick up the slack? Wishful thinking, I know. To conclude, even though a real character probably would have been better for my purposes, this guy still has some pretty good potential, if all of the stars align. -Until next time, I’m gonna reach for those stars. Are you?